I mentioned in my last article that supermarkets are some of the most advanced businesses in the world when it comes to manipulating customer behavior to increase sales. When you walk into a supermarket, you are surrounded by techniques and tactics all of which are designed to get you to buy stuff you don’t need in quantities you’ll never use. Knowing these techniques is one half of the battle. Forewarned is forearmed. 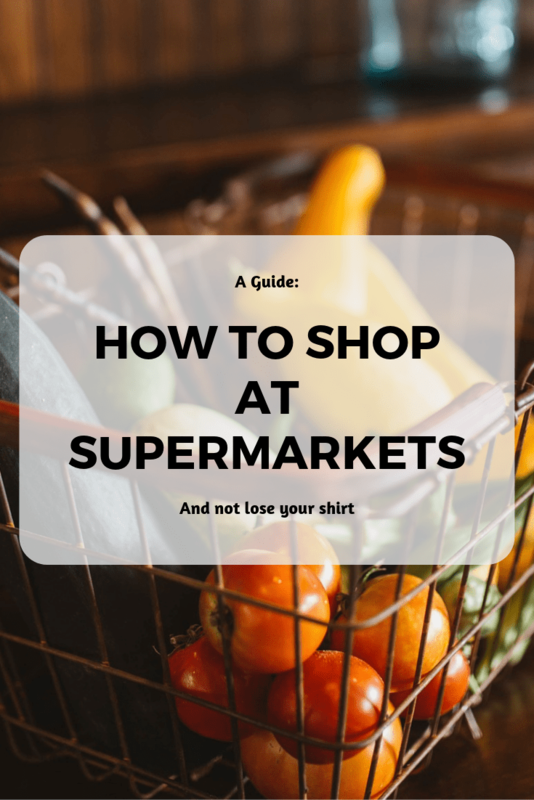 The second half of the battle are the strategies you should employ when shopping in a supermarket to make sure that you only buy what you need. Let’s take a look at the strategies that work. Being aware of the fact that you’re being influenced is, to a certain extent, an inoculation against that influence. When you see the kid’s toy hanging in front of the baby powder, you know it was put there because someone knew you’d be in that frame of mind when you saw it. When you walk halfway down an aisle to get to the eggs, and that makes you walk past all the foreign-influenced specialty foods, you know that’s a trick. You’d never seek out those foods, but walking past the colorful displays makes you wonder about cooking a meal with them. You can ignore them because you know the eggs were placed there to force you to walk past all these non-essential food items. But does knowing really help? These techniques are insidious. They’re not trying to convince you that it’s a good idea to buy something. They’re appealing to your wants and your emotions, so that after you’ve seen the guacamole, you’re convincing yourself that it’s a good purchase because deep inside you want it. Knowing all these techniques, even memorizing them and learning to spot them, will only go so far in avoiding additional spend. This is the big one. The “secret” that’s no secret at all, because it’s so bloody obvious that you knew it was the right answer. For some reason, however, few people, if any, wander around the store with a list. Everyone seems to be shopping based on wants rather than a plan. If you usually spend an hour in the shop, you should aim to spend 45 minutes planning the shop and 15 minutes actually shopping. The plan includes all the thinking and all the decisions. After there is only execution. This has the added benefit of leaving you exposed to the marketing and sales techniques for a limited amount of time. In your 45 minutes of planning, you should take out your meal plan for the days ahead (you have one, right?) and decide what ingredients you need to make them. Checking for stuff you already have in your pantry, you make a list of items you’ll need from the store. You then add household items you may be running low on, such as washing up liquid, diapers, etc, etc. Then you go to the website of your chosen supermarket and you build a shopping list of exactly what you’re going to buy in each one. A useful tool for this in the UK is mysupermarket, which allows you to compare the cost of a given shopping basket across multiple supermarkets and provides suggestions for cheaper options. Another useful site is SuperMarketOwnBrand, which compares the quality of white-label goods with the quality of expensive premium labels. If you have suggestions for your part of the world, please let me know or enter them in the comments below. Once in the shop, you buy only what’s on the list and you do it fast. By the time you’re at the check-out counter, you’ve got a trolley or basket full of produce and you know exactly how much it ought to cost. There are always issues with this. The fruit you wanted was running low and what was left was spoiled. The item you wanted wasn’t available in the right size so you bought two smaller sizes for a bit more money. Don’t sweat the small stuff. By meal planning and then using the meal plan to execute your purchases, you’ll have saved a ton. Just don’t allow yourself to get inspired while you’re in a supermarket! Can you get a different product? If you were going to buy turkey, can you switch to chicken? If you were looking for one brand, can you choose another, equivalent brand? Replace onions with shallots, zucchini with peppers, whatever still works for the recipe and doesn’t cost more or less? Can you downgrade, perhaps to the store’s own white-label product? If you can, perhaps you should have been buying that in the first place! In some cases, that’s not an option. For example, Waitrose fat free yoghurt is one third the price of the branded, Yeo Valley equivalent. Unfortunately it’s inedible (due to its weird, whipped-cream like texture), so that’s not an option. If the only choice is to upgrade to a better quality product, then see if you can make that product the centrepiece of the meal. This could allow you to reduce the quantity or cost of the other items in that meal plan. Pick more inexpensive vegetables, for example. Try to manage down the cost of that meal so the store’s lack of stock doesn’t cost you money. Generally speaking, you’re trying to either make lemonade out of lemons (find a cheaper alternative than the one you’d originally planned) or mitigate the damage caused by your now-limited options. This is a short one, but much more important than people think. Our self-control is a fickle thing, and walking into a supermarket hungry is like stepping into a boxing ring with someone twice your weight while hopped up on muscle relaxants. When you arrive at the supermarket, go straight to the farthest point from the entrance. Don’t purchase anything fresh, but start either at the baby section, the drinks section or the frozen food section. Gradually pile up what you need for the week, working your way through the dry goods. The last thing you shop for is fresh meat or fish, followed by vegetables. Then you hit the tills and get out of there. The fresh food is the most fragile thing you’ll buy. Especially the fruit and vegetables. If you put that in your basket first, it gets crushed. The fresh food is also the prettiest thing you buy. By spending time in this aisle, you are encouraged to think of all the food in front of you as healthy, wholesome and desirable. Better to buy monochrome stuff until you have only a few holes in your shopping list left to fill and you’re in a hurry to get out. The supermarket is laid out to manipulate emotions and purchasing behavior. Sabotage their efforts by not going around it the way they intended. I’m no expert on coupons. Because it’s a time-consuming exercise, how useful this is will depend on the value you attach to your time. This in turn is determined by how much you can earn in an hour and how much you value what free time is left after you’ve earned your money. I have very little free time, a decent income, and so some things have fallen below the line of “this is worth my time”. I may actually be wrong on couponing, because I’ve read about some insane savings, but I’m unsure that climbing that learning curve, setting up that organization and then doing the work to integrate coupons into my menu plan and shopping preparation adds up to a lot of value per hour. The two I’ve tried are : CheckoutSmart and ClickSnap, and they had exactly the same offers on both of them. I’m told these are great for saving money – so far I’ve not been able to find anything that I buy on any of these. I buy basic ingredients and we make meals from scratch at home. The brands that use these kinds of promotional methods are typically processed food brands that manufacture things like biscuits or ready meals. Maybe one day I’ll find something, but in the meantime the lack of impact on my spending makes it less and less likely that I will keep these on my phone.